Throughout the year 2017 one can come across the manifold Bethel jubilee activities: worship services, celebrations, exhibitions, activities and events, meetings and conferences with specific thematic focus. All of it takes place in the name of the 150 years jubilee. Members of staff, clients, relatives and friends of Bethel are invited to participate. 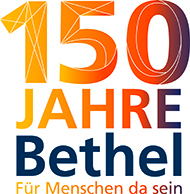 Under the headline "150 years Bethel-being there for people" we carry out jubilee activities between January 6th and Christmas eve 2017. In the four Bethel-regions Berlin/Brandenburg, Lower Saxony, Ruhr-area and Eastern Westphalia several teams are working on the implementation of the manifold ideas and plan the activities. Besides this the Central Public Relations Department "Dankort" prepares additional jubilee activities.